I booked my trip to Dubai in January, otherwise known as Annual Report Hell. It’s not that I dislike the corporate copywriting work that I do – I actually appreciate its diversity – but January reached fever pitch, when I was five months into the project but couldn’t yet see the finish line. Then KLM released their World Deals, and I remembered that one of my closest school friends was living in Dubai for three years. A few WhatsApps later and I’d booked my flight for the day my project finished. After that, I didn’t think much more about it – I was going for warmth, sunshine and a chance to catch up with an old friend. I very definitely wasn’t going for work, and I didn’t do any prior research about restaurants in Dubai. But two days into my holiday, I found myself eating at the newest Japanese warayaki restaurant on the block (more on that below) and before I knew it I was busy scouring the internet for the best places for Pakistani curries and then walking five kilometres to eat at them. Ordinarily, it would be hard for me to afford to eat at any of Dubai’s top restaurants (when you come from a country where you pay 50% tax to one where people pay zero tax, you’re at a significant fiscal disadvantage). But somehow, via a lucky friend-of-a-friend situation, I got an invitation to the soft launch of Netsu – the newly opened Japanese restaurant at Dubai’s Mandarin Oriental Hotel. And I wasn’t paying. 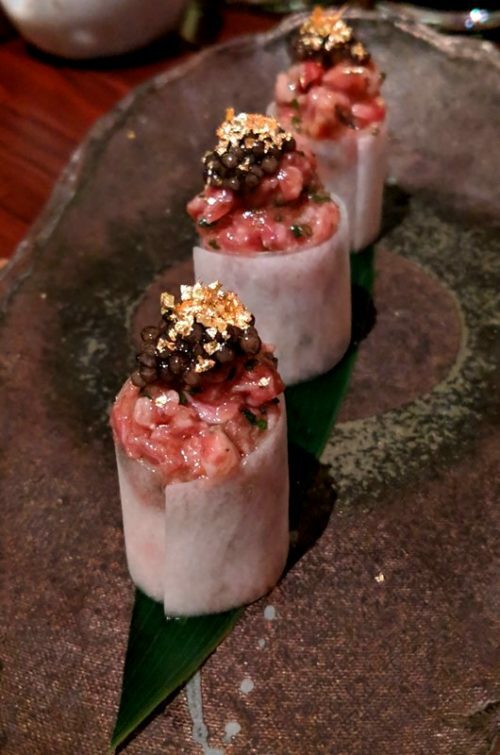 This was fortunate given Dubai’s propensity to add gold leaf to anything and everything – but all that bling didn’t distract Netsu’s diners from what transpired to be an outstanding meal. Suriyaki at Netsu, featuring gold leaf – because this is Dubai! For more information, visit the Mandarin Oriental Jumeira’s website. At completely the other end of the spectrum is Ravi’s: a name that came up every time I asked anyone in Dubai for their favourite curry house. This Pakistani institution has been running for donkey’s years, and it’s clear why. 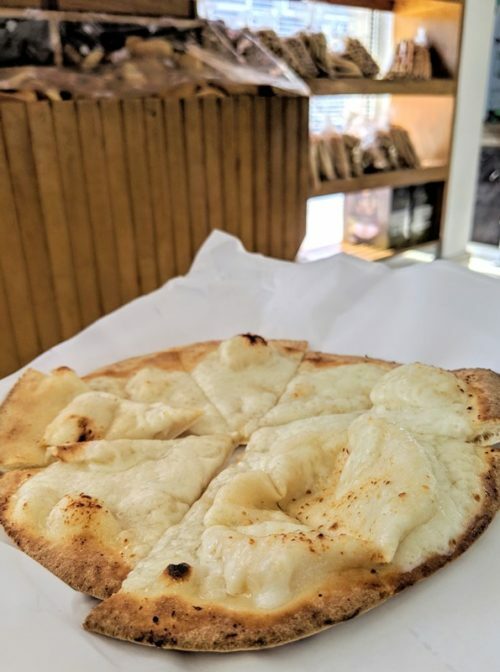 For 30 Dirhams (the equivalent of about €8), you can get one of the best curries you’ll ever eat, a simple roti to mop up the juices, and a small salad with yoghurt dressing to cool your mouth down after all that spice. 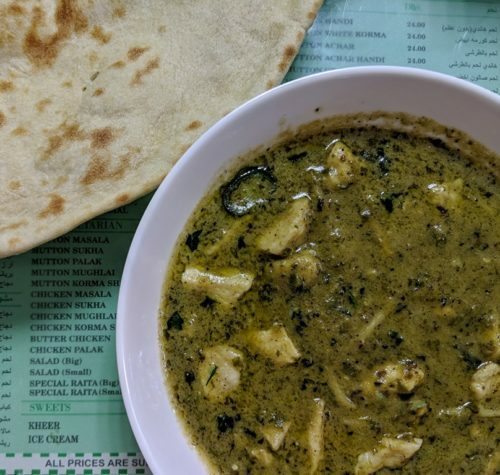 The green chicken masala that I ordered (with memories of my favourite curry house in Brixton) was hot and fruity from the green chillies, aromatic from the blend of warm spices, and fragrant from the fresh mint and coriander. A spice sensation. For more information, visit Ravi’s Facebook page. With similar décor and prices only a little higher than Ravi’s is Al Fannah: a fish restaurant along Jumeira Beach. From a counter in one corner, you simply point at your fish or seafood of choice – all marinated in a masala spice mix – and the chefs at Al Fannah will fry it up for you and serve it simply with lemon, rice, salad and a curry sauce on the side for those who like it extra spicy. 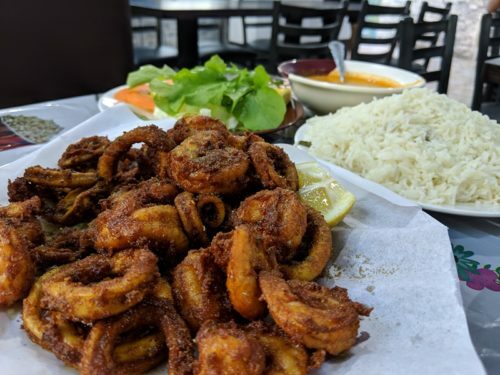 I tried the shrimp and calamari, both of which were perfectly cooked and perfectly spiced, for 74 Dirhams (€18) including all of the above. 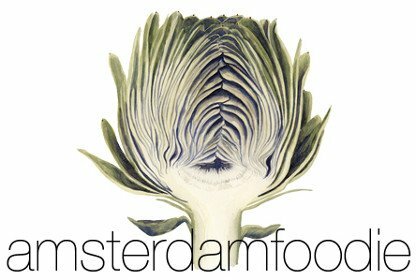 The portion size was huge – it was really enough for two people, which would’ve made it even better value for money. For more information, visit Al Fannah’s Facebook page. For more information, visit Al Reef’s Facebook page. If you’re looking for fish and seafood to take away, stop by the fish market at Jumeirah Beach for the freshest catch. Better still, you can take your purchase to the building next door to have your fish cleaned, butterflied, seasoned and grilled over the BBQ – you can eat it at the tables outside or take it home with you. Now that’s what I call service! For more information, visit Souk Al Bahar’s Facebook page. 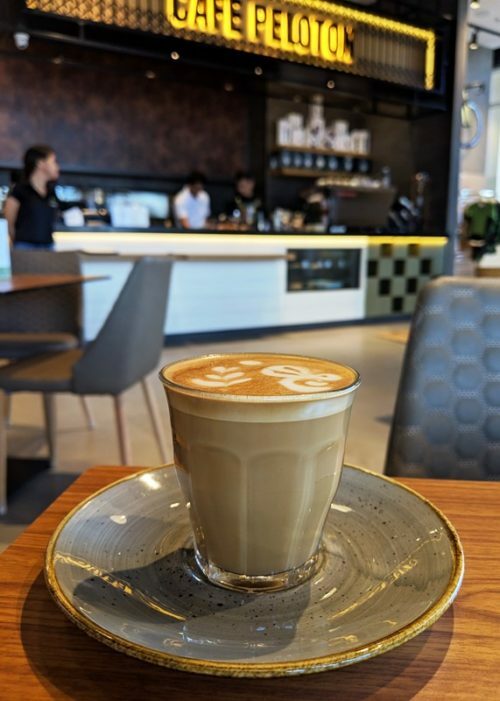 Targeting cyclists and coffee lovers, Café Peloton (which is handily around the corner from Al Reef Bakery – see above) is the perfect pit stop for puncture repair or caffeine cravings. When I was there, Peloton’s changing menu of specialty coffees offered four different types of beans prepared in seven different ways, from aeropress to syphon. It’s not cheap at 25 Dirhams (€6) a cup, but the quality of the brew and the barista’s attention to detail are exquisite. For more information, visit Café Peloton’s Instagram account.